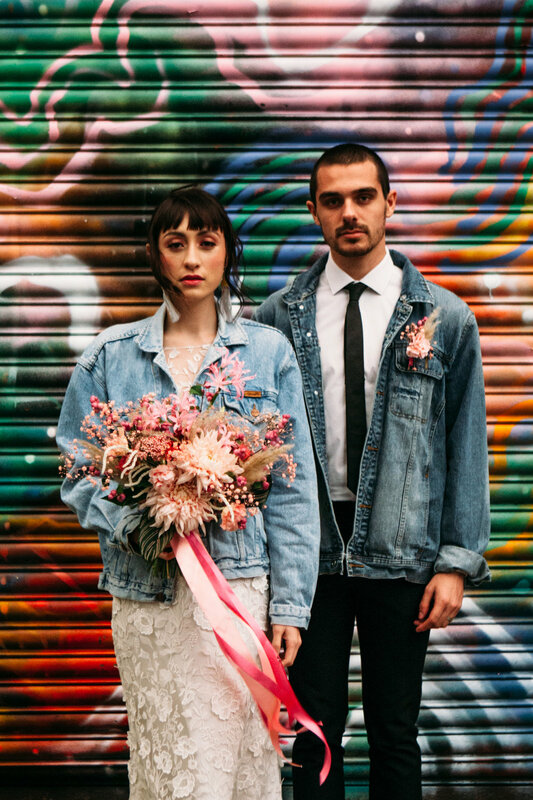 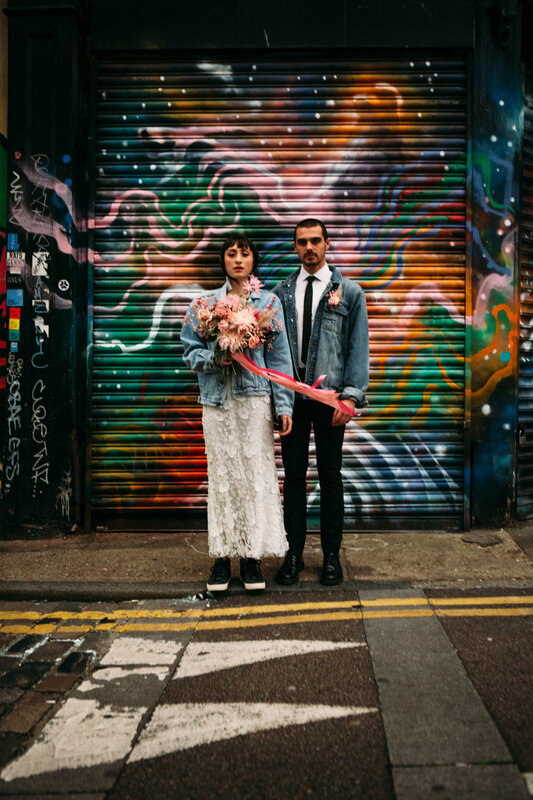 This shoot had the loose theme of pink and iridescence and the strict theme of an elopement, being badass, and above all, bloody good fun. 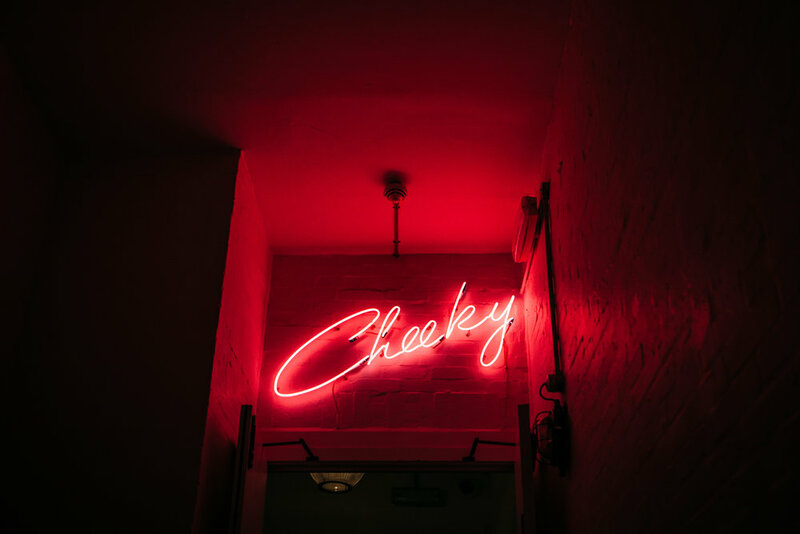 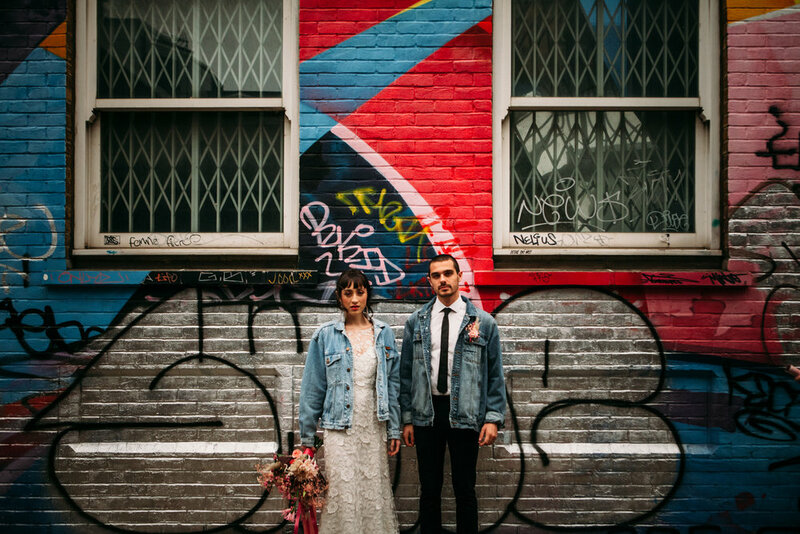 Both Charlotte from Redamancy and I (The Wedding Enthusiast, hollerrrrr) love East London and the amazing feel it has, and so we wanted something to reflect that. 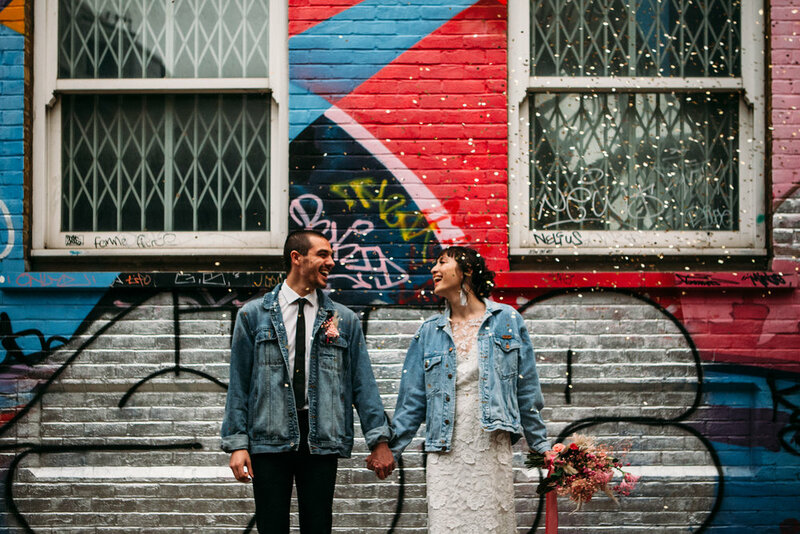 Whitewashed creams and trailing eucalyptus just didn’t capture the inimitable vibe that area has and frankly, they’re everywhere – absolutely beautiful, don’t get us wrong, but not representative of the whole market of couples. 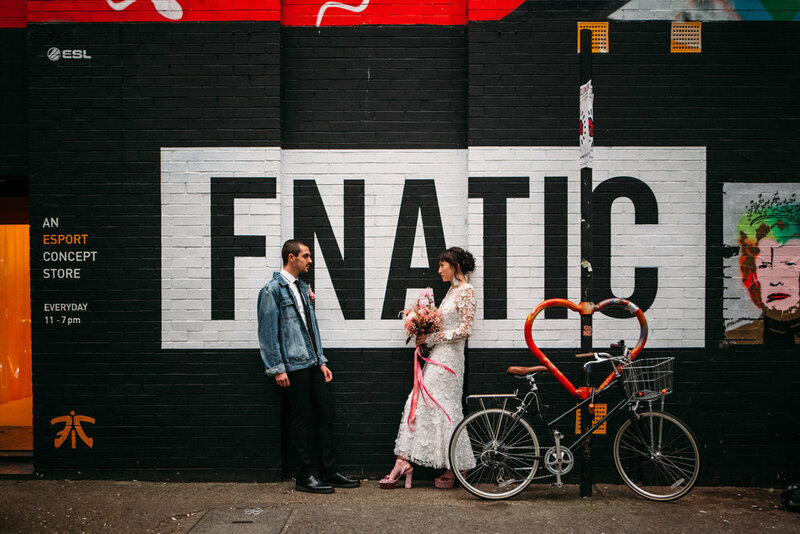 We wanted to do a shoot that really showcased what we as a team could do for brides who wanted something different. 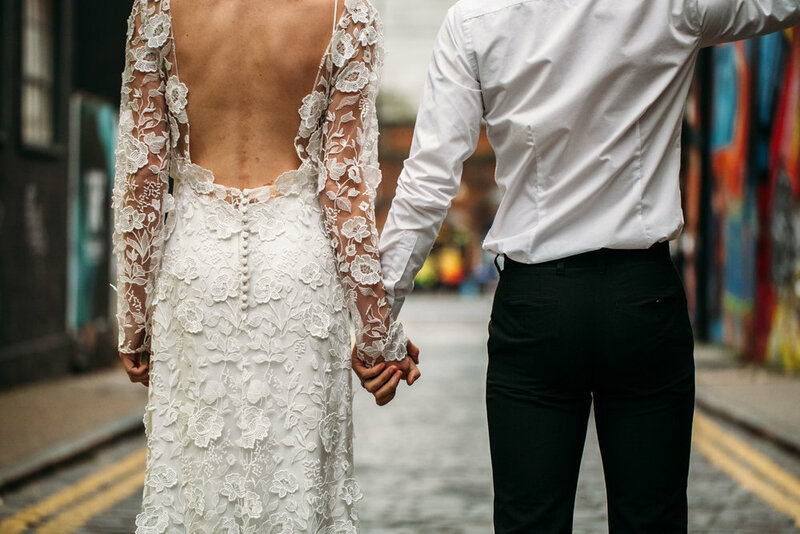 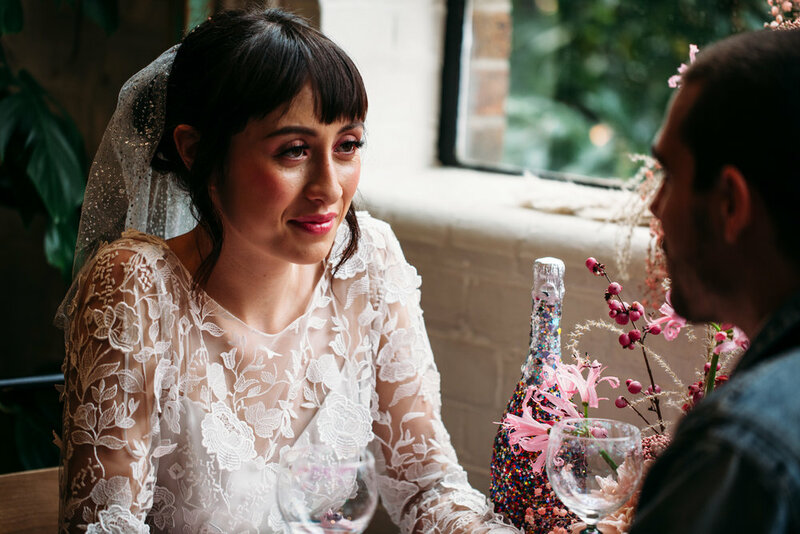 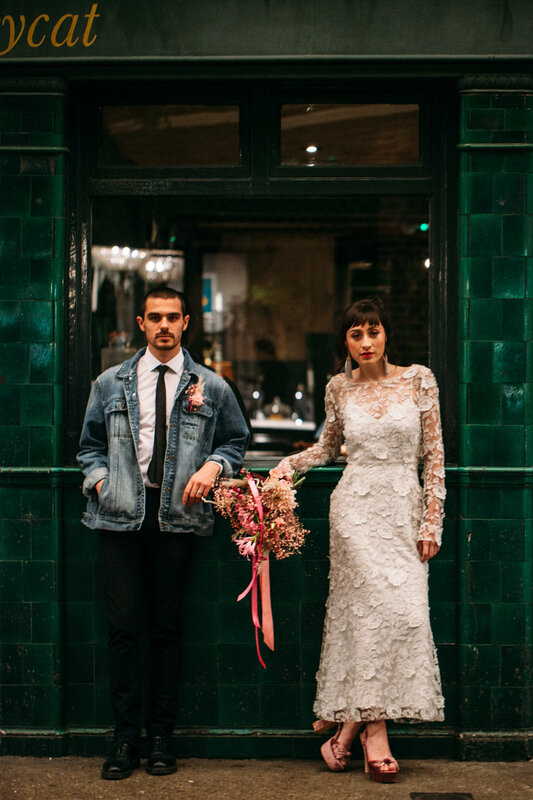 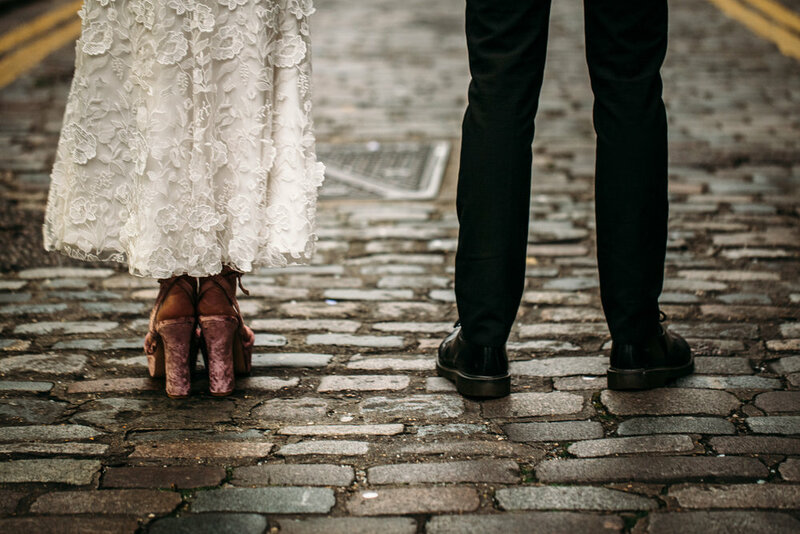 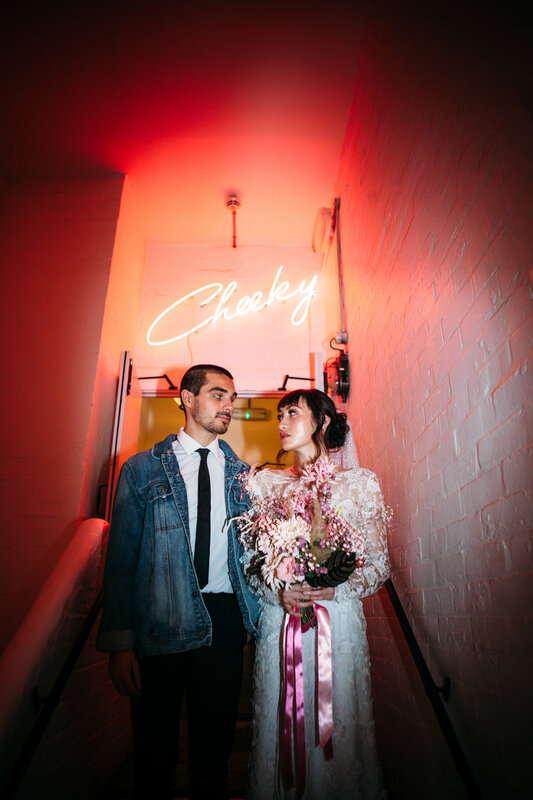 We wanted to maintain effortless cool with the details, so Cathleen’s midi-length Rime Arodaky dress from The Mews Bridal was worn with pink velvet platform heels, sleek, soft make-up by Amy George and slick hair by Hannah Domney with an AM Faulkner Bridal veil. 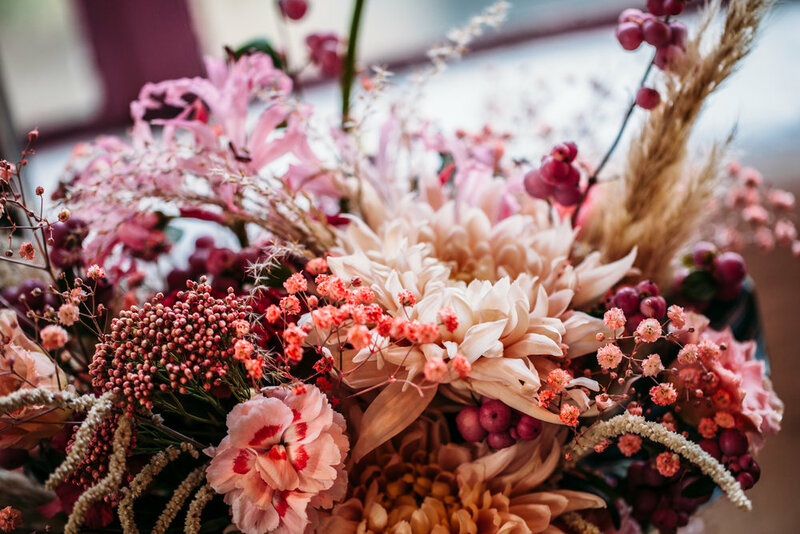 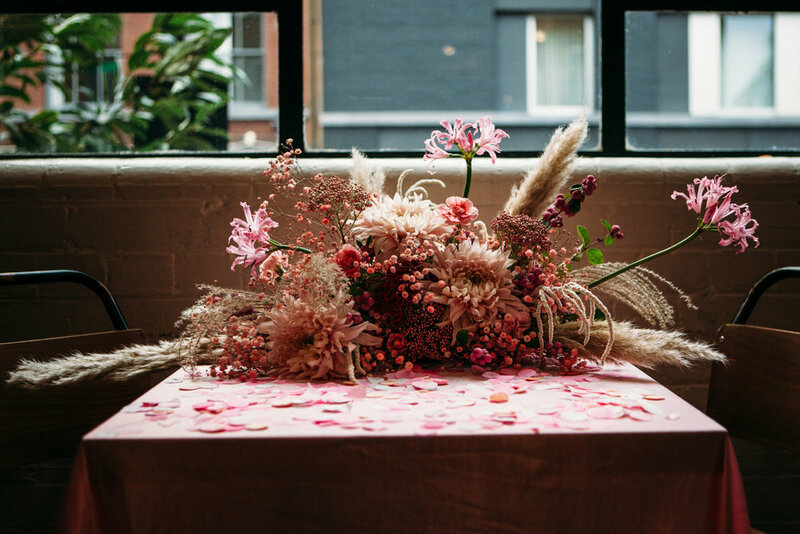 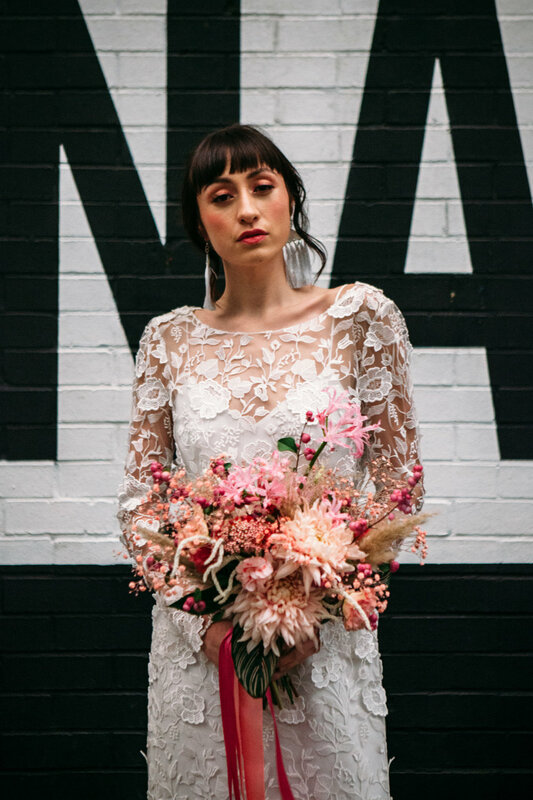 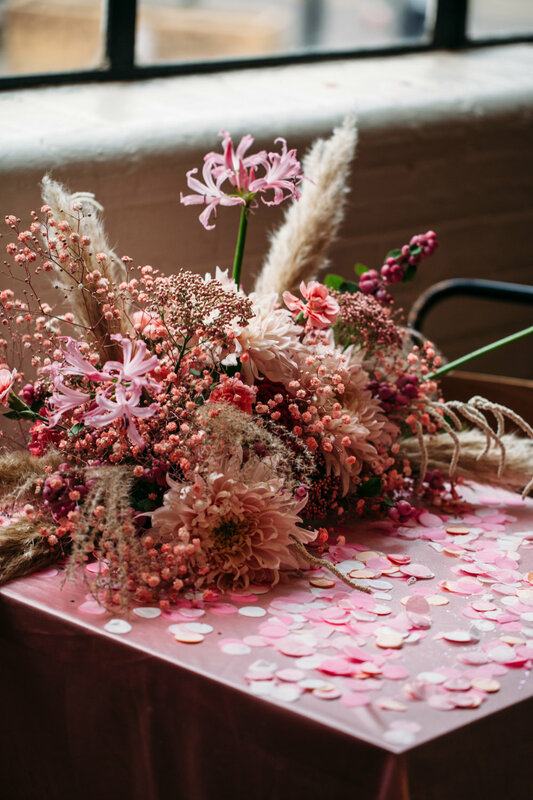 Bloaum Studio created a huge pink-toned bouquet with the most incredible textures and definition, which we took for a battering on the London streets. 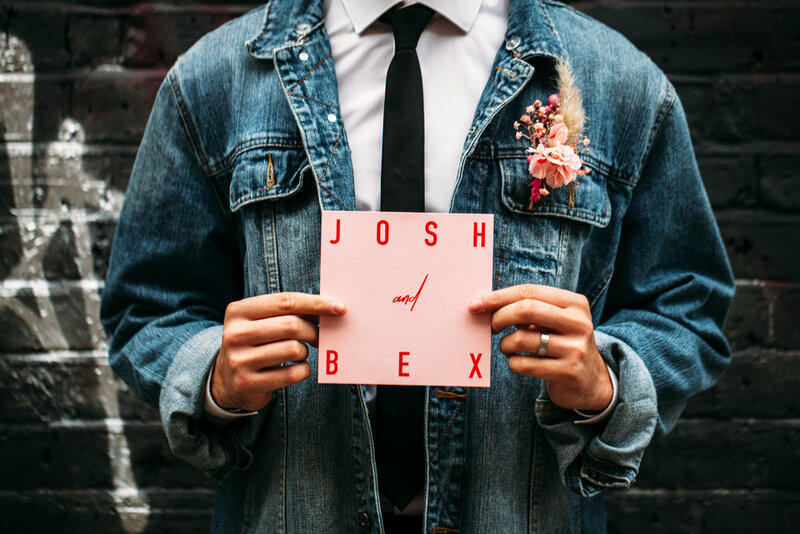 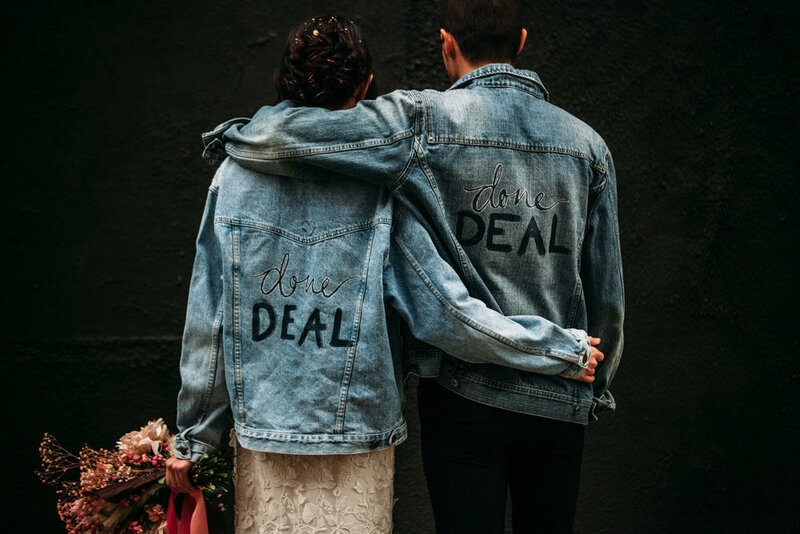 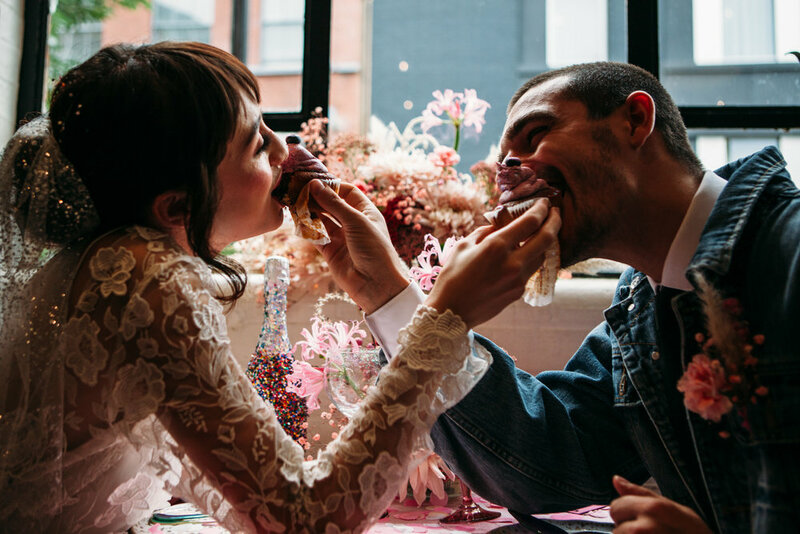 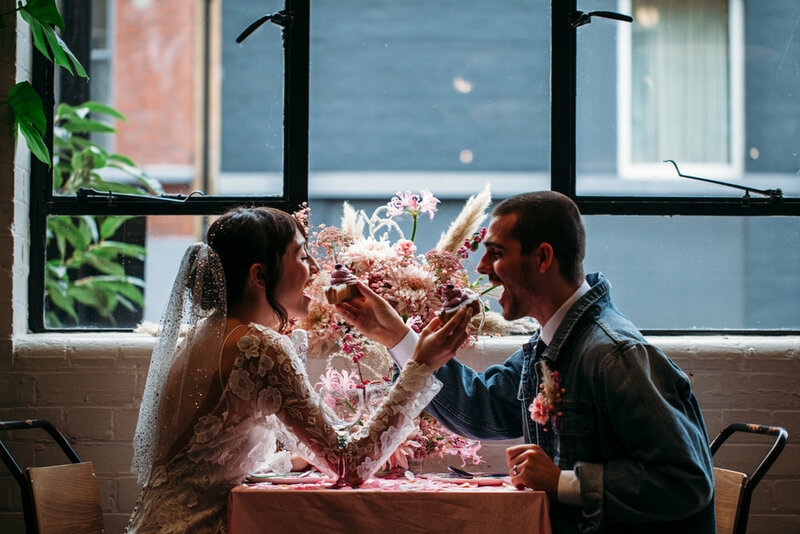 As it was an elopement shoot, we started with shots of just the two of them having a meal, channeling rebellious diner drives after just getting hitched in a Vegas chapel – but with more table styling, obviously. 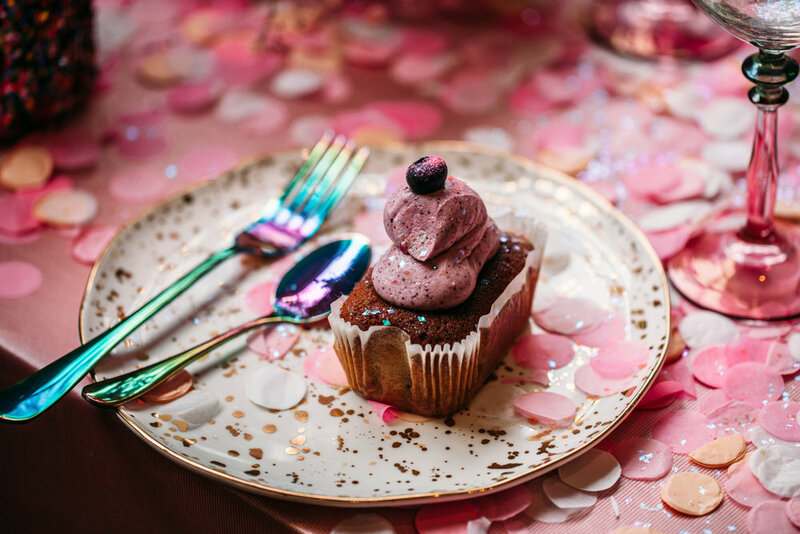 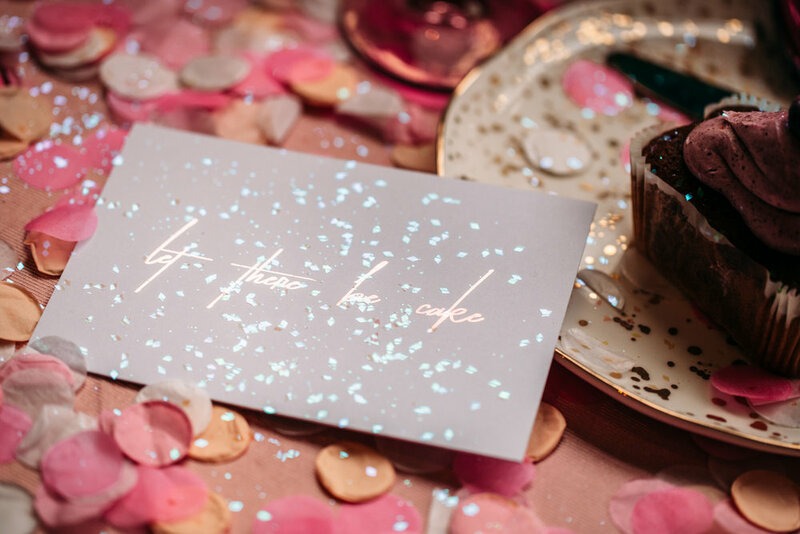 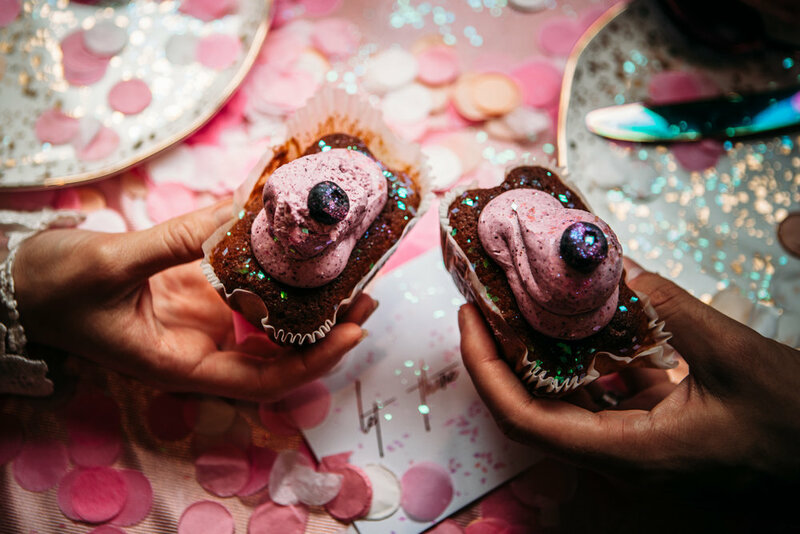 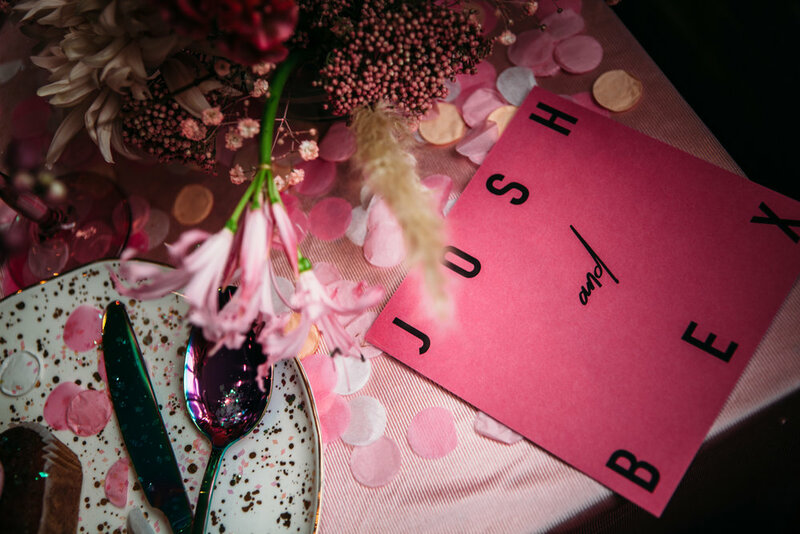 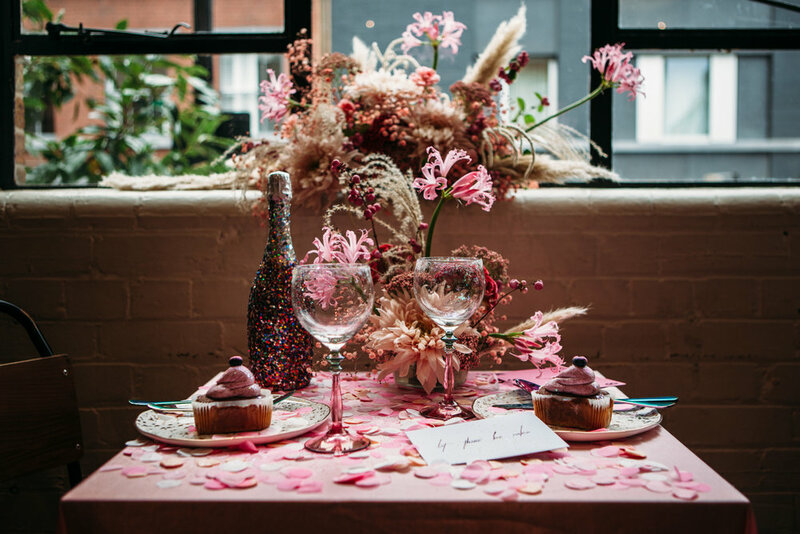 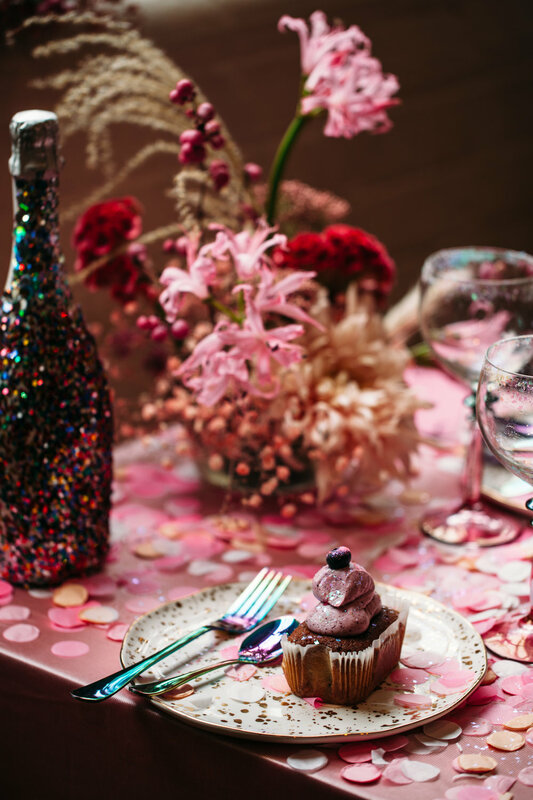 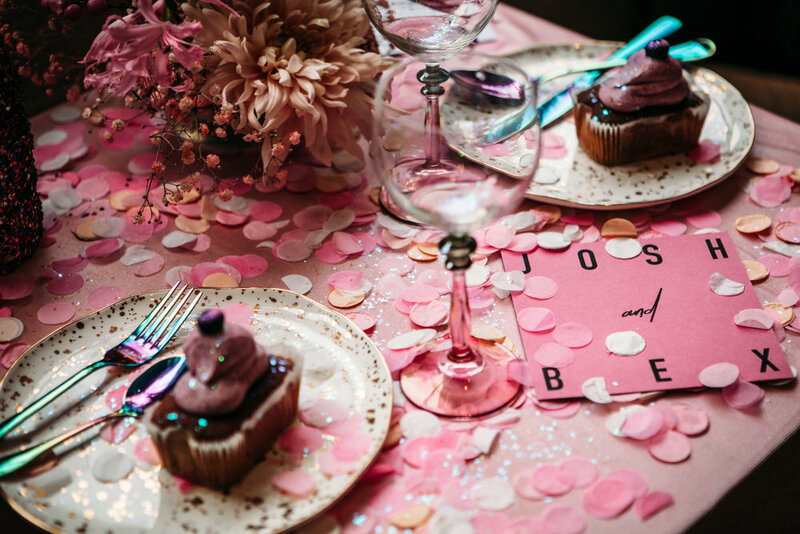 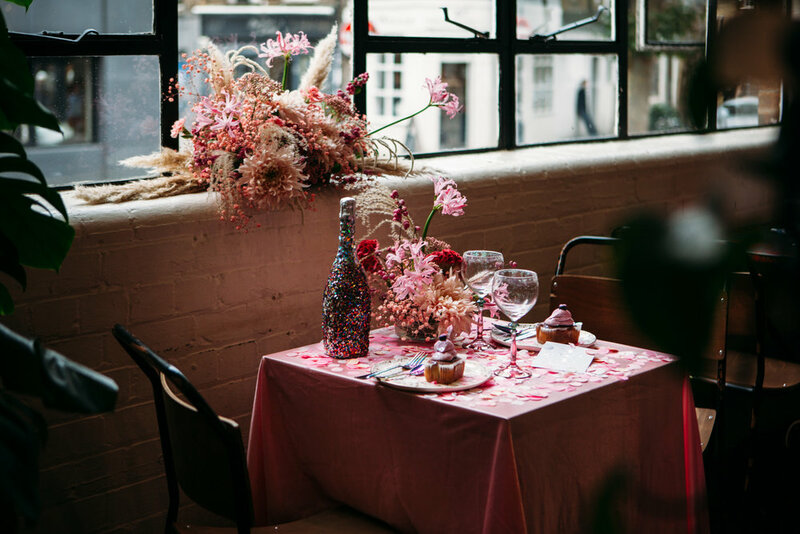 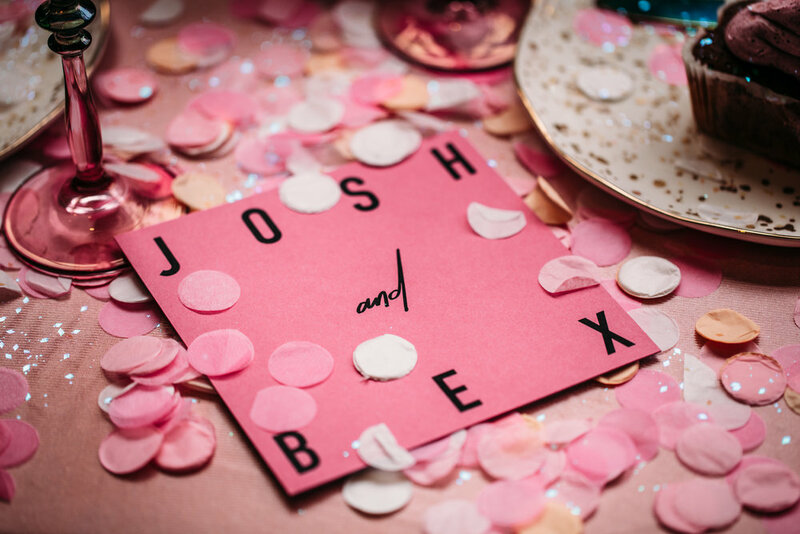 Redamancy, queen of tablescapes, created a stunning pink table set up with iridescent elements and – of course – confetti, alongside Keady Row‘s incredible ‘80s-inspired stationery (I’m still so in love with this font!). 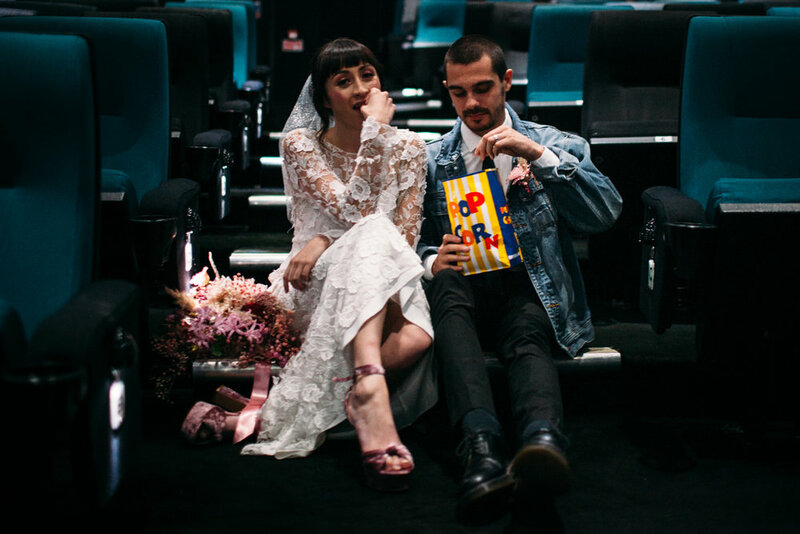 We then moved onto Rich Mix Cinema a couple of streets over, which is the most incredible cinema space with the loveliest staff. 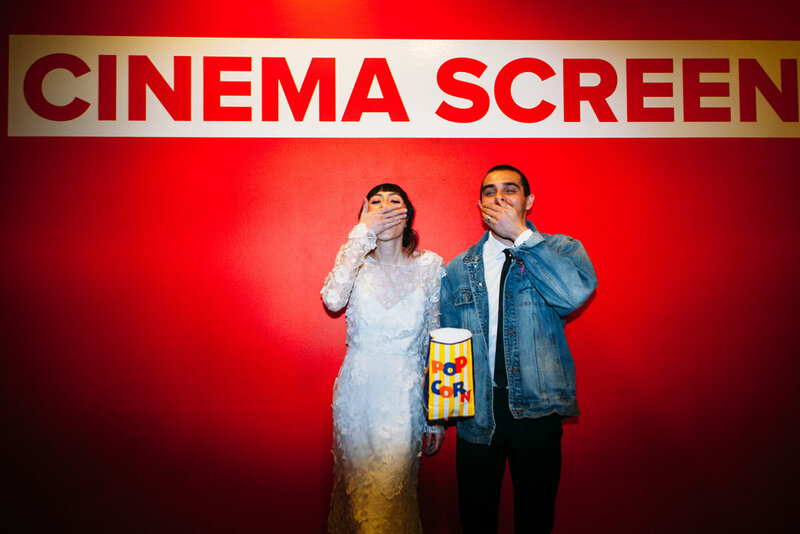 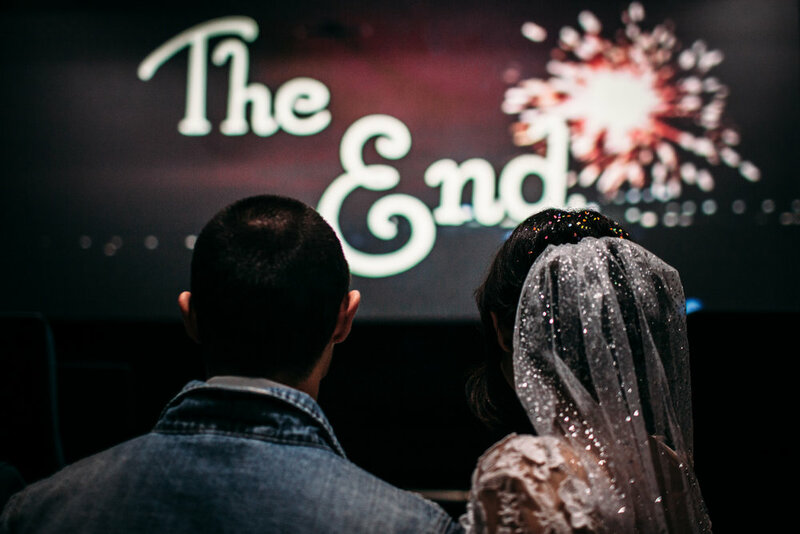 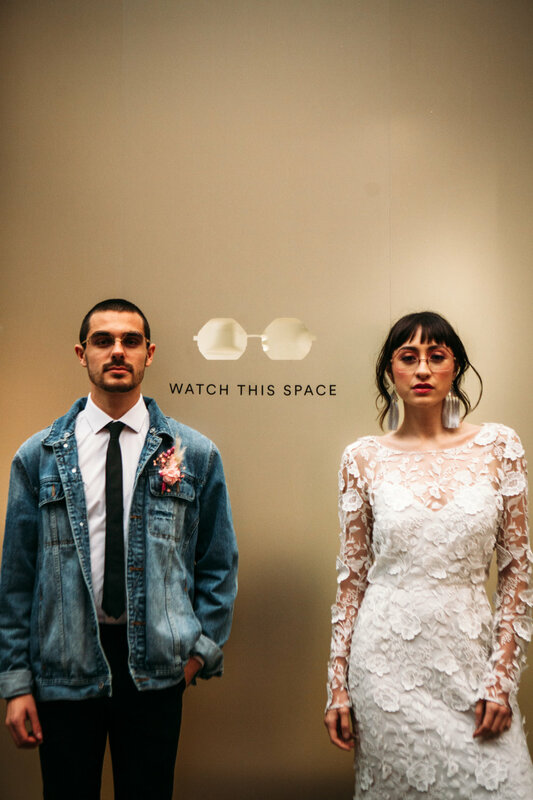 You can get married in one of the screens, with whatever you want playing on the screen behind you, making it SUCH an amazing space if you want somewhere totally different. 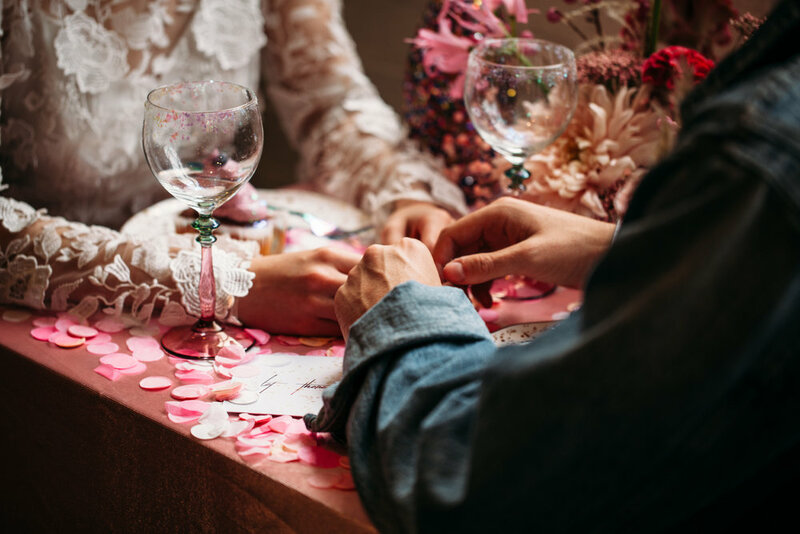 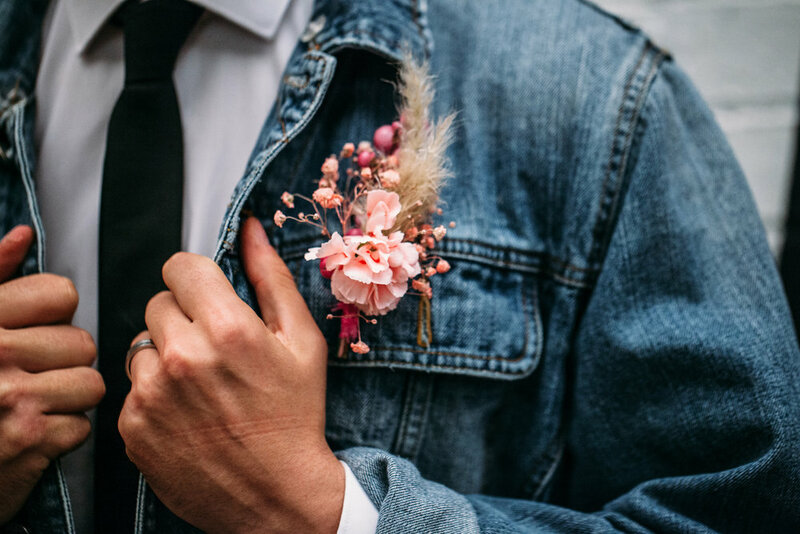 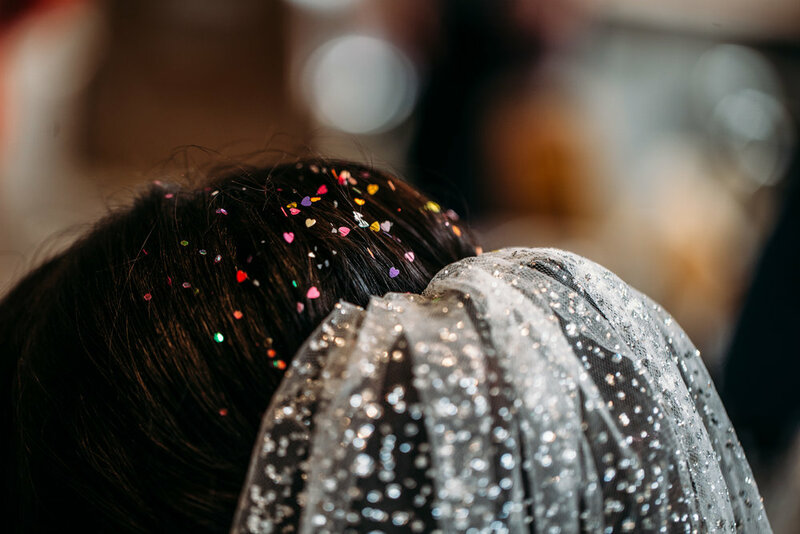 They’re also a charity, so not only are you doing something great for your wedding, but you’re giving back to the community too – we’re big, big fans. 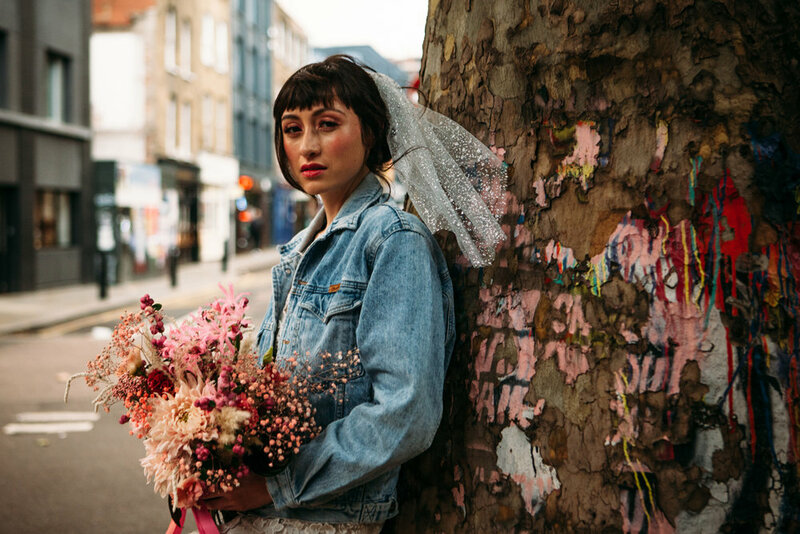 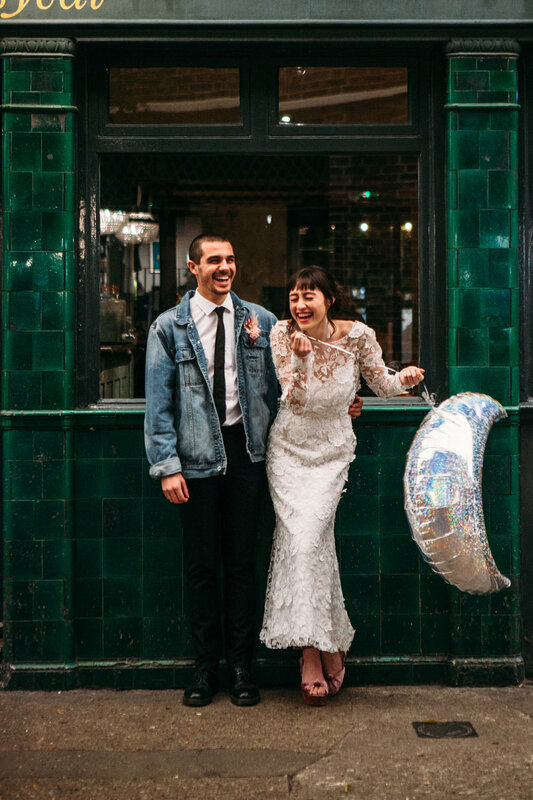 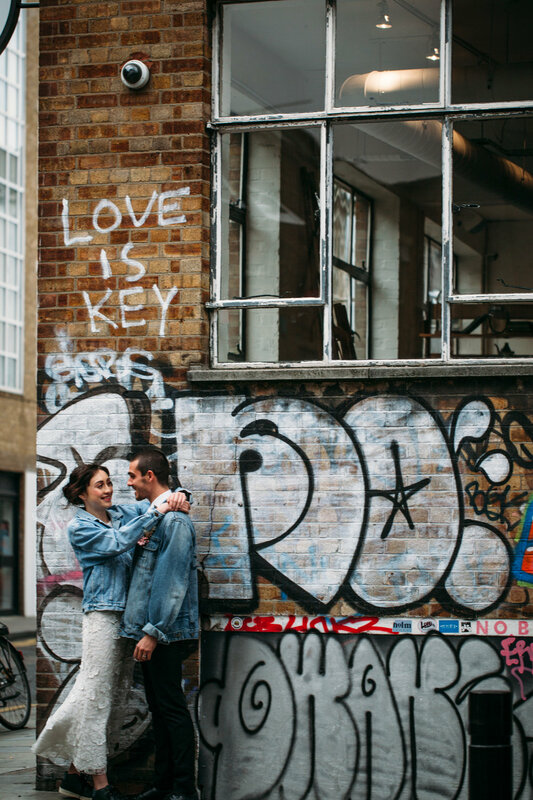 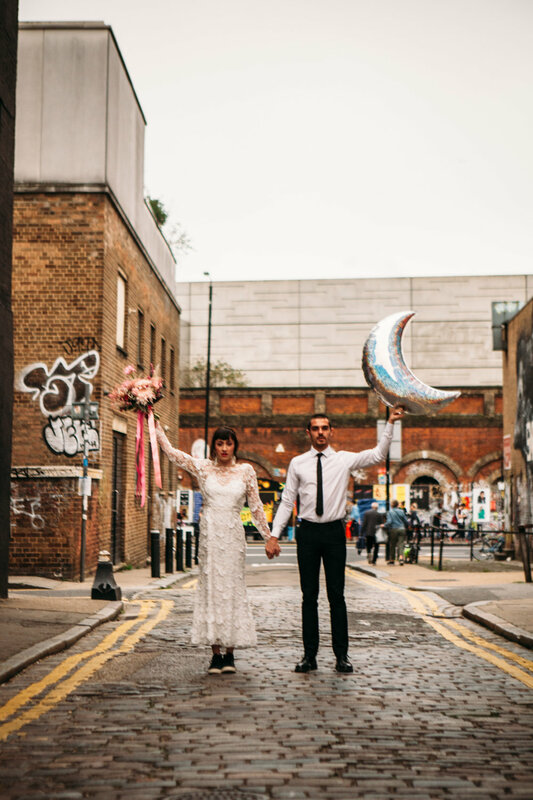 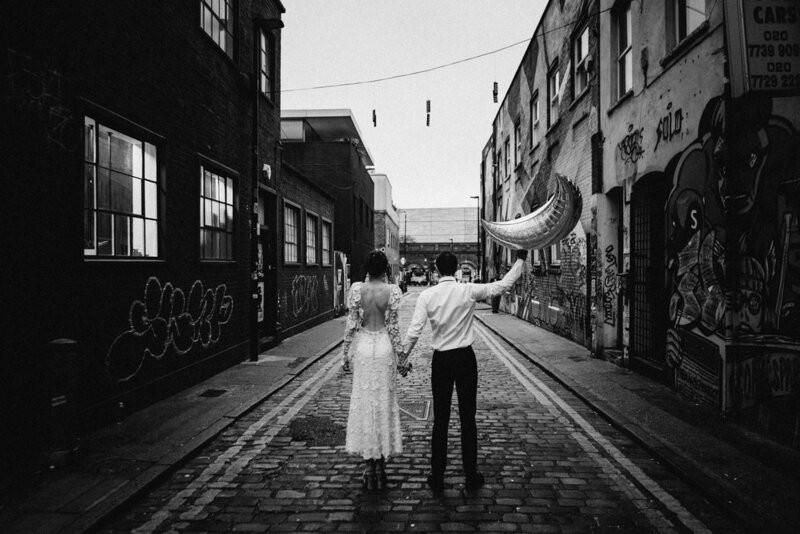 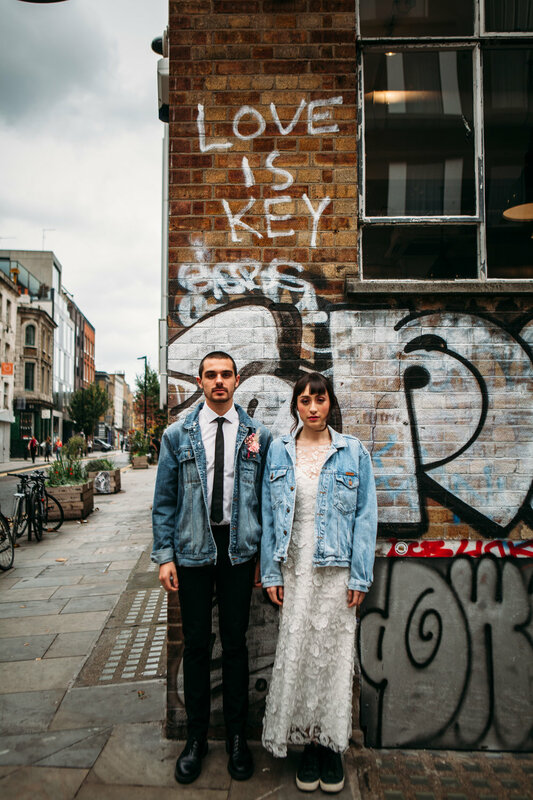 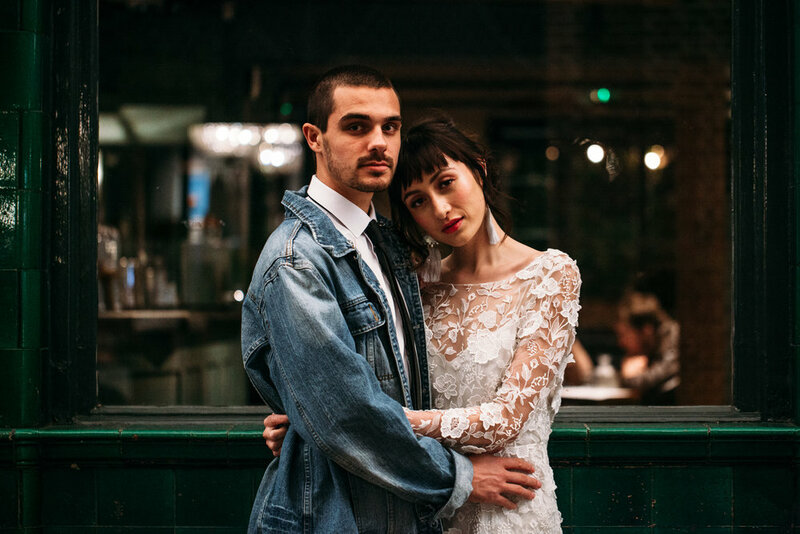 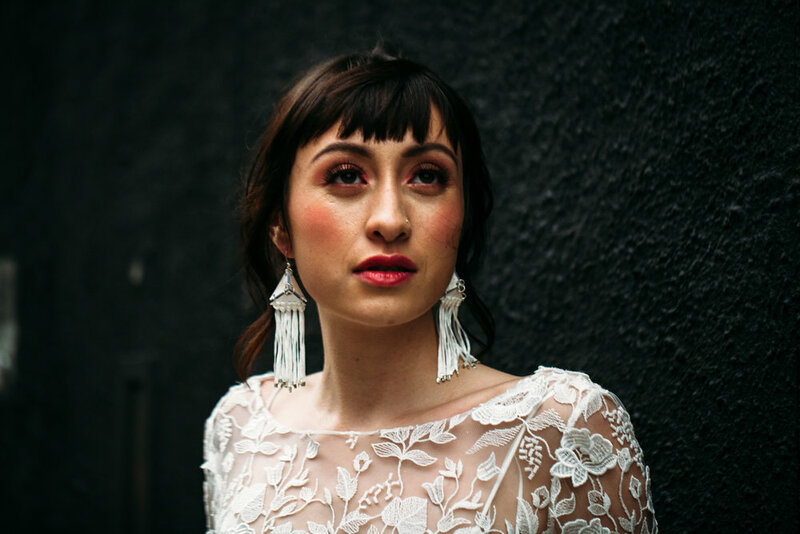 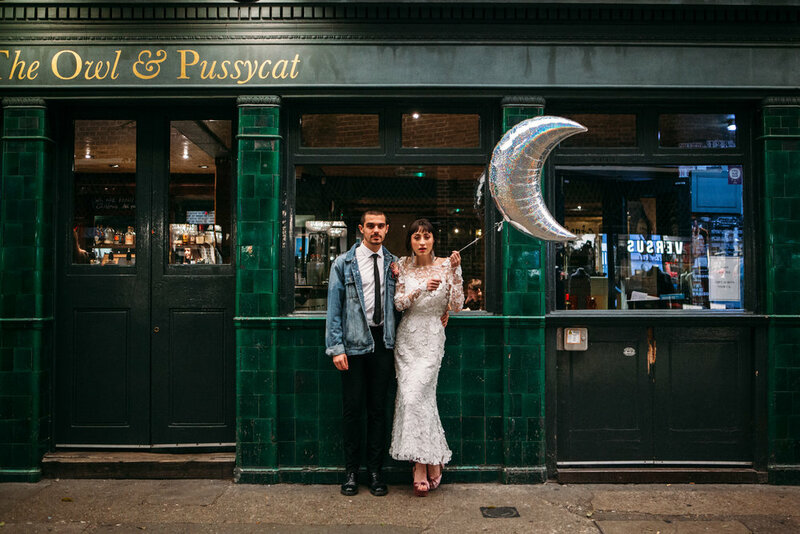 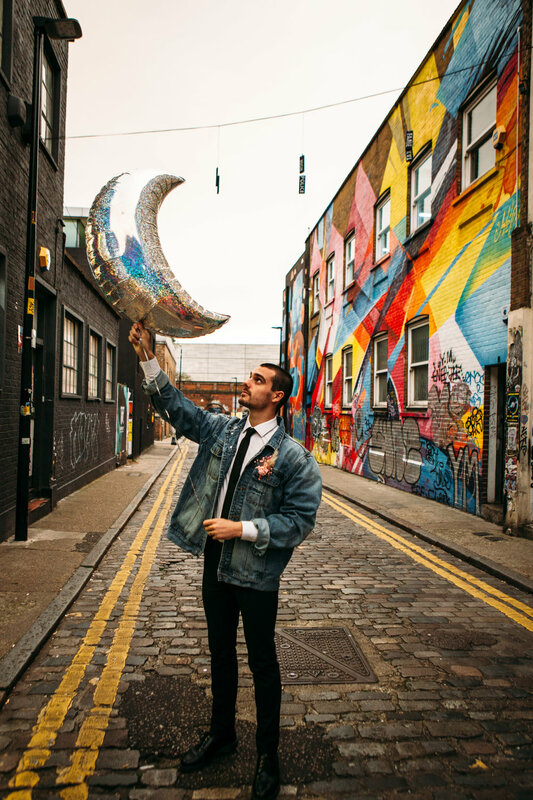 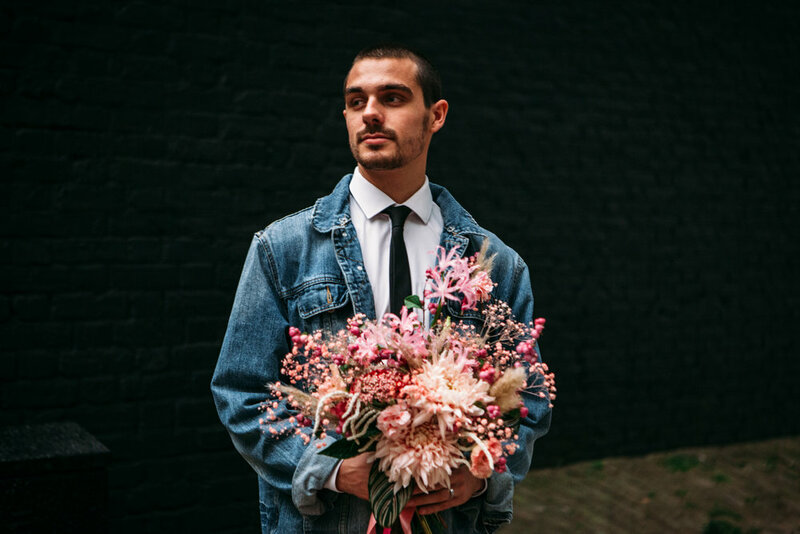 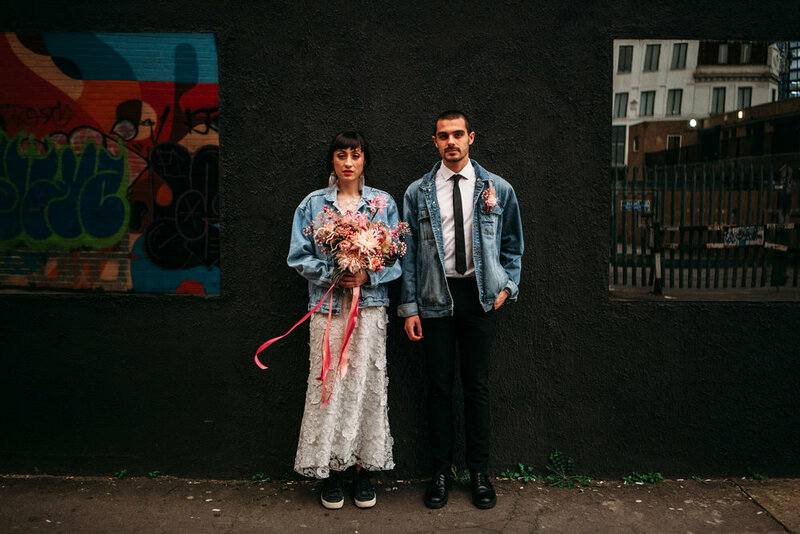 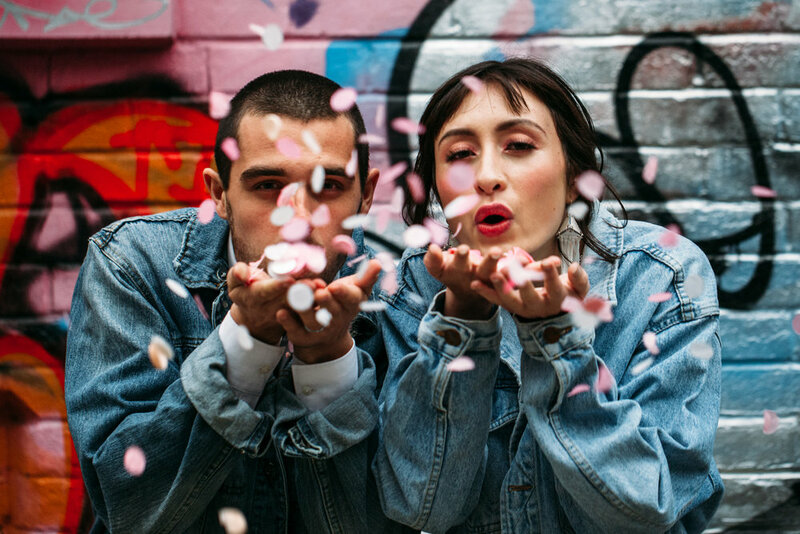 After that, of course, we went roaming the streets of Shoreditch to get some super cool couples’ portraits with the wonder that is Joanna Bongard. 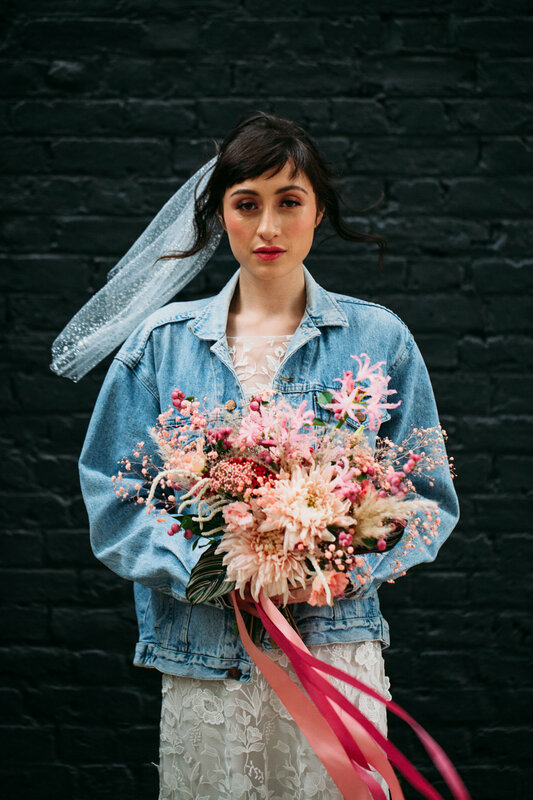 Even on a day where the sky was the literal colour of toffee and thick with Saharan sand (we kept joking that it was the end of the world and at least we were going out on a high) she was her usual joyful self, scouting out backdrops and frames like the pro she is. 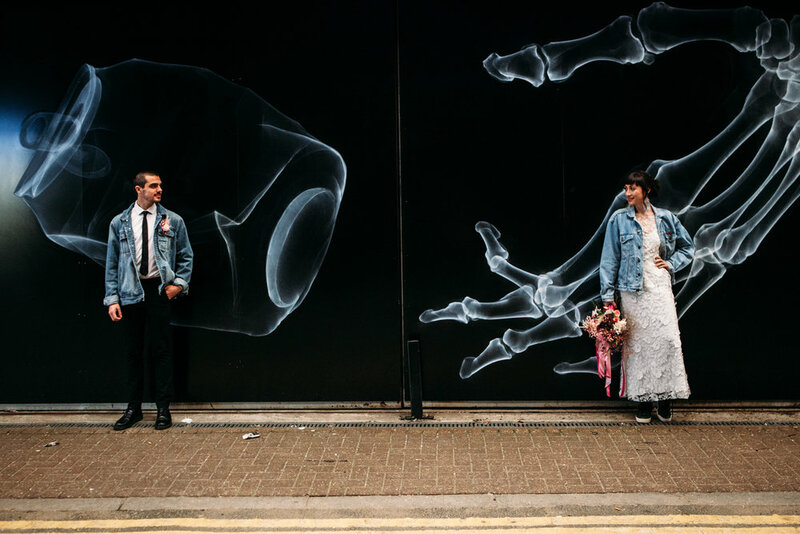 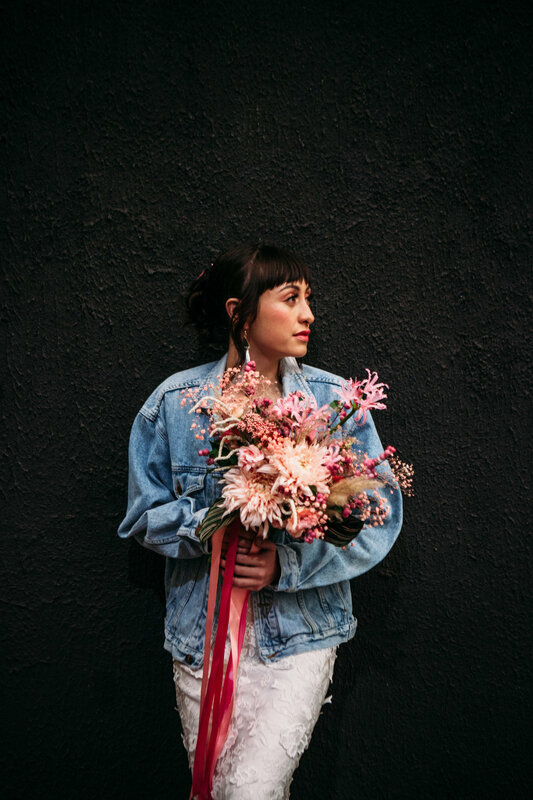 If incredible street art and hero shots are diamonds, Joanna was our magpie.